In September the Fowler Museum at UCLA will present “The Box Project: Uncommon Threads,” a collection of never-before-exhibited contemporary fiber artworks commissioned by noted Los Angeles collector, Lloyd Cotsen. This exhibition, which runs from Sept. 11 until Jan. 15, 2017, features pieces by three dozen acclaimed international artists including Richard Tuttle, Cynthia Schira, Helena Hernmarck, James Bassler, Gyöngy Laky, Gerhardt Knodel, Sherri Smith, N. Dash, Lewis Knauss, Ana Lisa Hedstrom, Kiyomi Iwata, Nancy Koenigsberg, and John Garrett. It showcases these artists’ ingenious use — and often expansive definitions — of fiber, while exploring the collector/artist relationship. In the early 2000s, an array of artists received an intriguing invitation from Cotsen and his then curator, Mary Hunt Kahlenberg. 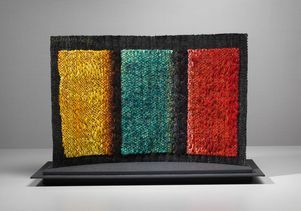 Would the artists — most of whom generally create two-dimensional fiber works — be game to attempt a three-dimensional piece that could fit into a relatively small and shallow box? What followed were years of fascinating correspondence with the artists who would participate in the project. As expected, each interpreted the challenge in his or her own way, resulting in an exceedingly diverse collection of works that reflects the artists’ skill and creativity. 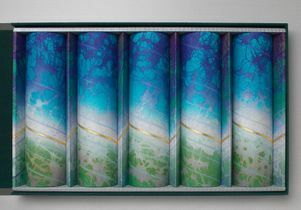 Most of the pieces in the show are presented in their accompanying 23-inch by 14-inch by 3-inch or 14-inch by 14-inch by 3-inch boxes. Additional and more typical examples of some of the artists’ oeuvre will also be featured to contextualize how they were challenged by the project. The exhibition spotlights the incredible versatility of fiber as a medium and delves into the interrelationship among artists, their process, and the collector, as well as the evolving position of fiber art in the larger art world. Many of the artists represented push the definitional boundaries of fiber. Plastic tubing, copper wire, paper, Manzanita wood, zippers, buttons, beads, magnets, reflective tape, rubber sponges and spools of thread are used to great effect. Similarly, the themes and appearances of the works themselves are as numerous as the materials employed. “Cosmos,” 2005, Naomi Kobayashi. Rolled Gampi paper marked with sumi ink; paper thread woven in plain weave. Virginia Davis’ submission conjures the vastness of the night sky, while Ai Kijima’s quilted fabric collage employs the pop culture imagery of children’s cartoons. Knodel and James Bassler both invoke game boards, but in ways solely their own. Some works, like Masae Bamba’s delicate garden of mushrooms topped with an ethereal shibori-dyed butterfly wing, reside neatly into their boxes. 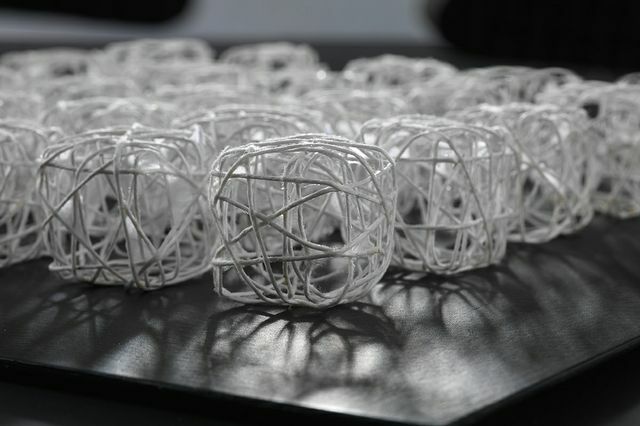 Others, such as Aune Taamal’s delicate, translucent weaving, can be stored in their boxes but lavishly overflow their confines when unfolded for display. The small scale of the works commissioned for the Box Project offers viewers an intimate experience with the art, while larger works borrowed exclusively for the exhibition to provide comparison along with video interviews, material samples, maquettes, correspondence, and concept sketches provide detailed information on the artists and their processes. Cotsen has built and dispersed several world-class collections — with the collaboration of his textile curator and longtime friend, Kahlenberg (who died in October 2011), and Stapleton — including the world’s most comprehensive collection of Japanese bamboo baskets, now at the Asian Art Museum in San Francisco. In the mid-1990s Cotsen, Kahlenberg and Stapleton began to assemble a new collection of textile fragments from every era and region of the world. Titled “Textile Traces,” this study collection now comprises approximately 4,500 fragments that demonstrate every possible method of weaving, fiber, surface treatment, and design. Cotsen determined that all the fragments be smaller than 23 by 14 inches and kept in beautiful handmade, indigo cloth-covered storage boxes — the same boxes that have become integral to the Box Project. In setting these physical parameters, Cotsen came to appreciate the power of limits. As he put it, “When I place restrictions on my collecting, the results are more dynamic.” Understanding that boundaries can encourage innovation, he was curious to see how artists might respond to a commission with specific limitations. 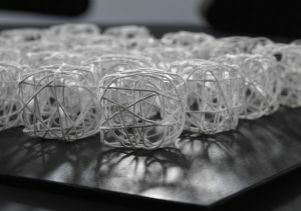 Thus was born The Box Project: Uncommon Threads, an exhibition that would ask artists who usually work in two dimensions to create something three-dimensional that would fit within the confines of a Textile Traces box. The 36 artists whose work appears in this exhibition are Bamba, Bassler, Mary Bero, Zane Berzina, Dash, Davis, Carson Fox, Shigeki Fukumoto, Garrett, Hedstrom, Hernmarck, Agneta Hobin, Pat Hodson, Iwata, Gere Kavanaugh, Ai Kijima, Hideaki Kizaki, Knauss, Koenigsberg, Knodel, Naomi Kobayashi, Laky, Paola Moreno, Jun Mitsuhashi, Kyoko Nitta, Hisako Sekijima, Barbara Murak, Schira, Heidrun Schimmel, Carol Shinn, Smith, Tabatabai, Koji Takaki, Taamal, Tuttle and Peter Weber. The Fowler Museum at UCLA is one of the country’s most respected institutions devoted to exploring the arts and cultures of Africa, Asia and the Pacific, and the Americas. The Fowler is open Wednesday from noon until 8 p.m., and Thursday through Sunday from noon to 5 p.m. The museum is closed Mondays and Tuesdays. The Fowler Museum, part of UCLA Arts, is located in the north part of the UCLA campus. Admission is free. Parking is available for a maximum of $12 in Lot 4. For more information, the public may call 310 825-4361 or visit fowler.ucla.edu. The Box Project: Uncommon Threads is organized by the Cotsen Foundation for Academic Research with the Racine Art Museum, and curated by Stapleton and Bruce Pepich, executive director and curator of collections, Racine Art Museum. After its display at the Fowler Museum, it will travel to the Racine Art Museum in Wisconsin (spring 2017) and the Textile Museum at George Washington University in Washington, D.C. (fall 2017). A related hardcover book titled “The Box Project: Works from the Lloyd Cotsen Collection” is available at the Fowler’s Museum Store for $95. 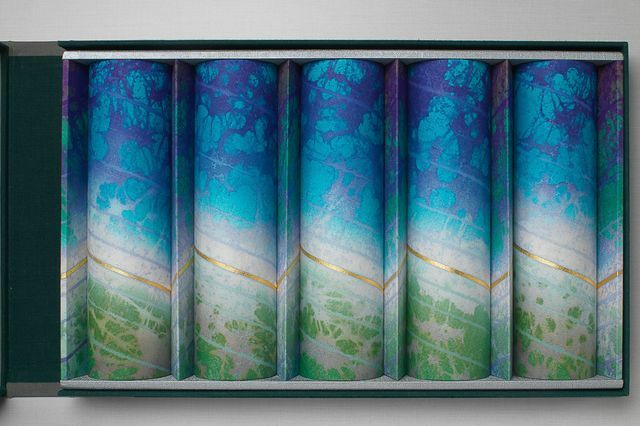 Saturday, Sept. 10, 6:30–7:30 p.m.
Exhibiting artists Gere Kavanaugh, Gyöngy Laky and Hisako Sekijima discuss their creative processes and commissioned works for the Box Project with Lyssa Stapleton, curator of the Cotsen Collection. Free. RSVP by Sept. 2 to fowlerrsvp@arts.ucla.edu or 310-206-7001. Priority seating for Fowler members begins at 6:15 p.m. Reception to follow. 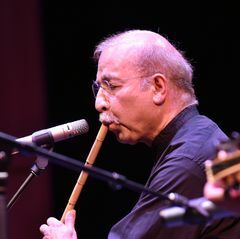 Support for Sekijima’s travel is provided by The Japan Foundation, Los Angeles.